Women who experience less pain during childbirth may be less vulnerable to postpartum depression, according to a study presented at the 2016 Anesthesiology annual meeting. Data from the American Psychological Association suggests as many as 1 in 7 women experience postpartum depression. Symptoms include those of major depression, such as feelings of hopelessness, sadness, and difficulty enjoying pleasurable activities. Some women with postpartum depression may also struggle to bond with their babies. A small fraction of women with postpartum depression also experience postpartum psychosis, which can cause delusions and hallucinations that could result in harm to the mother or the baby. Could Better Pain Management Improve Mothers’ Mental Health? To weigh the effects of pain during labor, researchers reviewed medical records of 201 women who had given birth. Each of the women had received an epidural to control pain during labor and rated their pain on a scale of 1-10. At six weeks postpartum, the scientists used the Edinburgh Postnatal Depression Scale to measure symptoms of postpartum depression in participants. Women who reported greater reductions in pain after receiving an epidural had fewer symptoms of postpartum depression. The study’s authors say better pain management might have reduced the women’s depression risk, suggesting pain during labor could be a risk factor for postpartum depression. The study did not directly assess the effects of epidurals on postpartum depression, so it is unclear if effective epidural use reduced depression or if some other factor was more significant. The study did not compare women who received epidurals to those who did not. Other research supports the theory that pain may contribute to mental health issues after birth. A 2012 study published in the Israel Medical Association Journal found as many as 1 in 3 women experience posttraumatic stress after giving birth. A large portion of women who viewed their births as traumatic experienced no pain relief during labor. Postpartum depression is a complex condition that is likely caused by an interaction between body chemistry—including postpartum hormonal shifts—and the environment. A family history of postpartum depression, a previous mental health diagnosis, and the hormonal changes associated with birth may increase the risk. The stress of becoming a mother in addition to financial woes, inadequate support from family or a partner, isolation, a traumatic birth, having a baby with special needs, and conflicted feelings about the pregnancy also increase women’s vulnerability to postpartum depression. Mothers who are breastfeeding may be reluctant to seek help, due to concerns about the effects of antidepressants on breast milk. But therapy, lifestyle changes, and social support can all help women experiencing depression. Postpartum Progress offers comprehensive assistance, including online support, access to local resources, and information about postpartum depression. 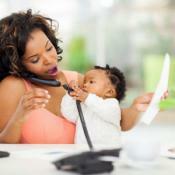 Are ‘High-Octane’ Women More Prone to Postpartum Depression? Believable! The amount of pain and the ability to handle that pain and manage it more effectively probably does do a great deal toward creating your opinions about the whole pregnancy, childbirth, and mothering process. That’s what an epidural is for.